Sarah Nader- snader@shawmedia.com Marian Central's Davis Meyn, 16, of Crystal Lake unloads food at the Woodstock Food Pantry Friday, March 18, 2016. Marian Central, Woodstock and Woodstock North all participated in the week long food drive at their schools. Sarah Nader- snader@shawmedia.com Marian Central's Shelia Sagear, 17, of Huntley unloads food at the Woodstock Food Pantry Friday, March 18, 2016. Marian Central, Woodstock and Woodstock North all participated in the week long food drive at their schools. 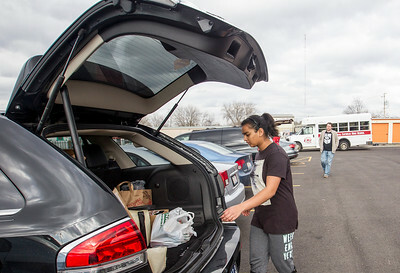 Sarah Nader- snader@shawmedia.com Woodstock's Pooja Patel, 17, of Woodstock unloads food at the Woodstock Food Pantry Friday, March 18, 2016. Marian Central, Woodstock and Woodstock North all participated in the week long food drive at their schools. Sarah Nader- snader@shawmedia.com Marian Central's Shelia Sagear (left), 17, of Huntley hands a box of food to Davis Meyn, 16, of Crystal Lake unload food at the Woodstock Food Pantry Friday, March 18, 2016. 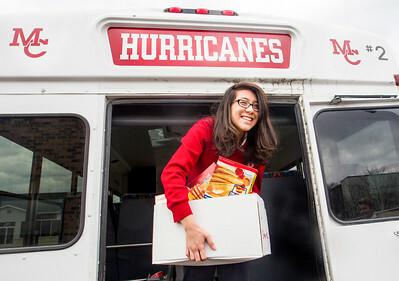 Marian Central, Woodstock and Woodstock North all participated in the week long food drive at their schools. Sarah Nader- snader@shawmedia.com Marian Central's Kelly Mink (left), 17, of Crystal Lake and Claire Vanderbosch, 17, of Algonquin unload food at the Woodstock Food Pantry Friday, March 18, 2016. Marian Central, Woodstock and Woodstock North all participated in the week long food drive at their schools. At Marian Central, every student was asked to bring an item for each club or sport they participate in. Marian Central's Shelia Sagear, 17, of Huntley unloads food at the Woodstock Food Pantry Friday, March 18, 2016. 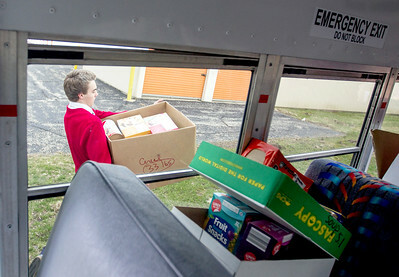 Marian Central, Woodstock and Woodstock North all participated in the week long food drive at their schools.